You must make reservations at least 5 minutes in advance of the time at Molos. 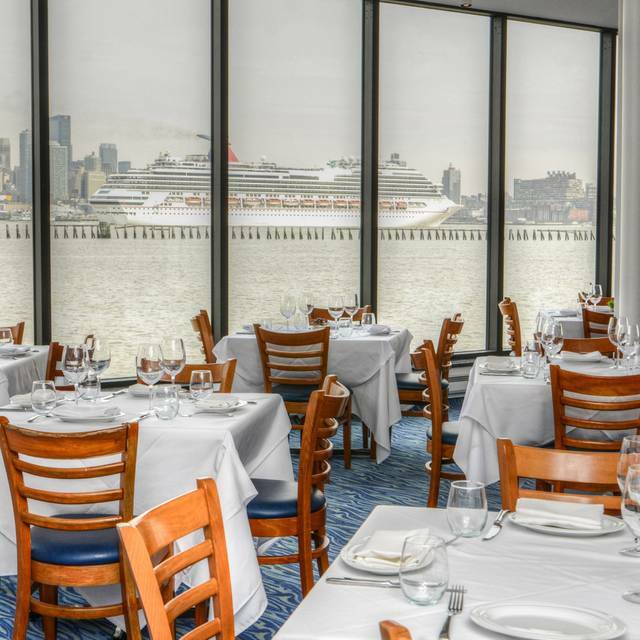 Take the New York Waterway to Port Imperial Ferry Stop. Take the Light Rail to Port Imperial stop. 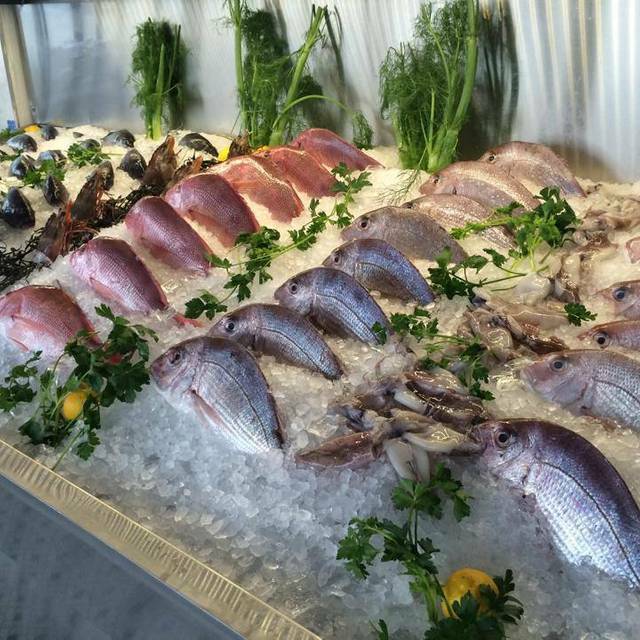 Monday - Friday 4 P.M. - 7 P.M.
Molos offers guests the freshest seafood available, prepared with uncompromising quality on a daily basis, while embodying the quality and pride epitomized by the generations of fishermen who would gather their daily catches on the docks of the Mediterranean. 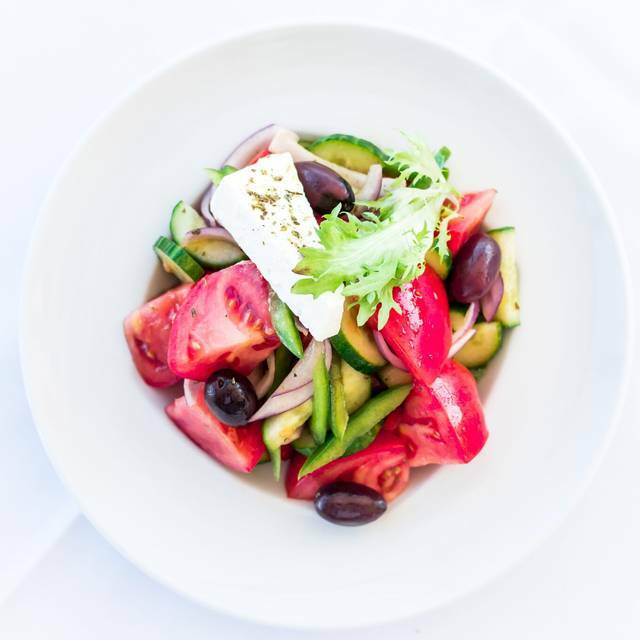 Celebrate Father's Day at Molos! Specials all day! Family night out. The service was great. Friendly staff. Amazing food. Great view. Great brunch with unlimited mimosa/Bloody Mary option! Amazing views. Can’t wait to come back and sit on the patio. It's quite hard to beat this place. 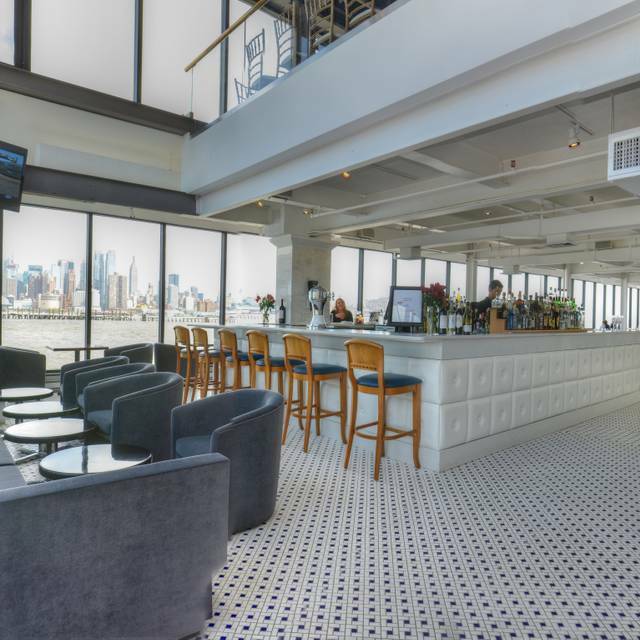 Incredible views - right on the Hudson, with a view of NYC. For the record, I grew up with that view and their view still blew me away. Incredible food - I've had the wild salmon, lavraki, lobster risotto, octopus, and crab cakes so far. All have been quite good! Finally, the service has consistently been of the highest quality - especially, the bartenders and waiters. Whether you are looking to create a romantic evening or simply gather with humans you care about, this is a great spot. Great Views, but more importantly what a great menu to choose from. Great Service too! 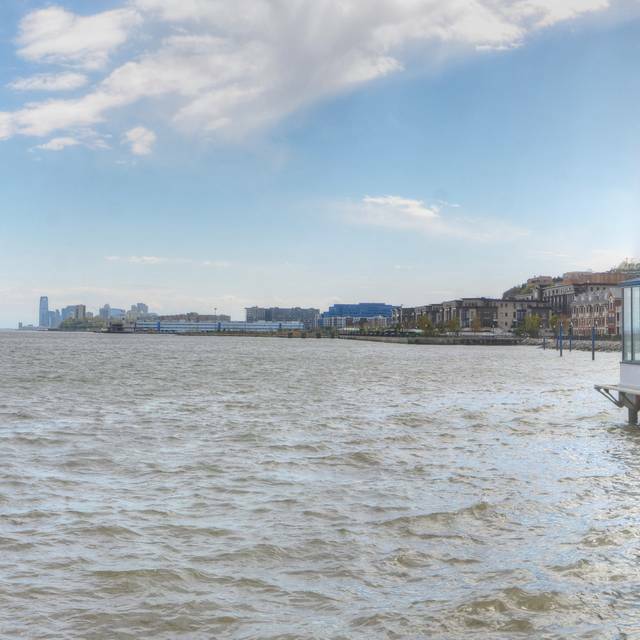 The location and views are great making it a very popular spot. While there, they had 2 different parties going on (a long table of 12 people and 100 people upstairs). I do take into consideration I may have come on a bad day as another time in the winter it was a much more pleasant experience. We waited 20 minutes to be seated even though we had reservations and staff was very slow to get to us. That being said, the staff was very polite and pleasant. Food was good but nothing great. Place is beautiful. Would try to avoid brunch and do a dinner date there instead. Worst service ever. Took about 20min to get car valeted. We were a party of 9. It took 20 minutes to get our table ready. Had to ask servers multiple times for water to be refilled, bread brought to the table, etc. at the conclusion of our meal waited until we asked the manager to get our table cleared. It was laughably bad service. Pros: fish tacos were delicious and the view into Manhattan was gorgeous! The grass outside was also a nice place for the kids to run around afterwards. Food was exquisite. View is incredible. If you are looking for seafood brunch, don't come here. I was really hoping for a variety of brunch dishes with a hint of seafood (being that they promote themselves as a seafood restaurant), but they serve (good) basic brunch dishes. I asked to see the dinner menu, and that looks way more interesting :-) Will have to come back and try their dinner service. Food and view always great..Exceptional service from Elvis..
Food was great, wonderfull olive oil and good service. The view is simply breathtaking, no better view anywhere. The menu was interesting, food quality was very good, excellent fish. Service was good. Not an inexpensive evening but worth the price in all respects! The view was spectacular. 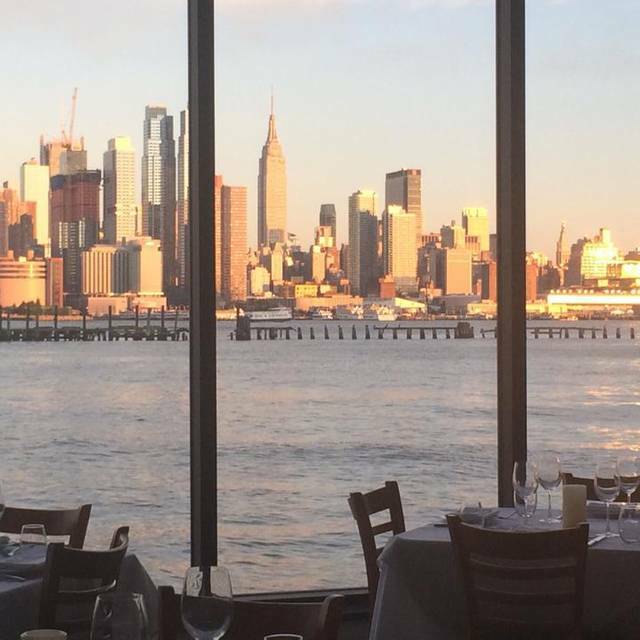 We were seated by the window overlooking the water and NYC. The sun set while we ate and was stunning. The food and service was very good and the value was reasonable given the expense of such a location. Great for a special event. Wonderful discovery. Unbeatable views and good food for a unique experience. 100% recommendable. The food was good this time. My friends loved the atmosphere and the view as well the ambience. The service was good. But it could improve. Price is a bit steep, but the view and the friends make it worthwhile. This place rivals any of the top Greek places in the city with a much better view better prices and overall the owner jerry is a class act. Highly recommended. The view is great. It wasn't a busy night, yet the service was slow. 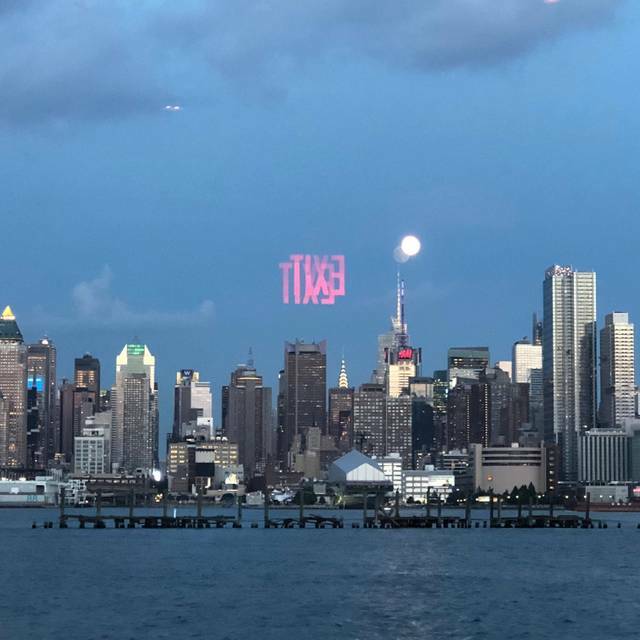 Food was good and I would go back but there are some great other places on the Hudson with a great view too. 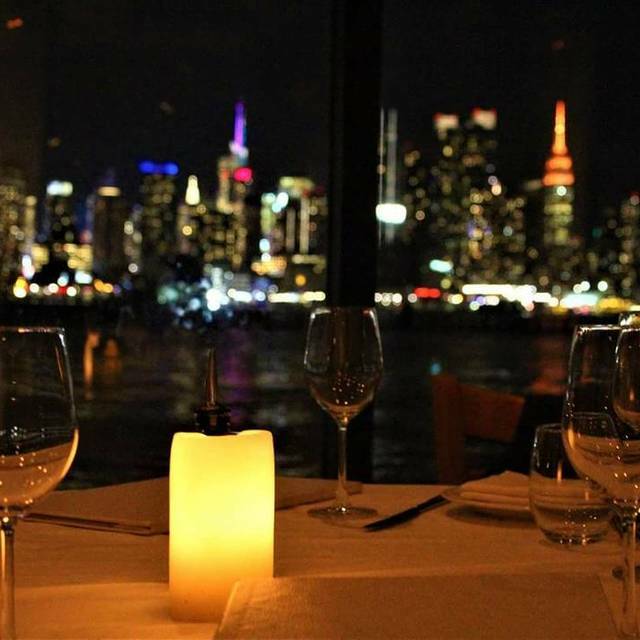 Nice view of Manhattan and so many tables to offer. They have a large parking lot too. A wonderful dining experience. Fresh Seafood and a wonderful wine list. 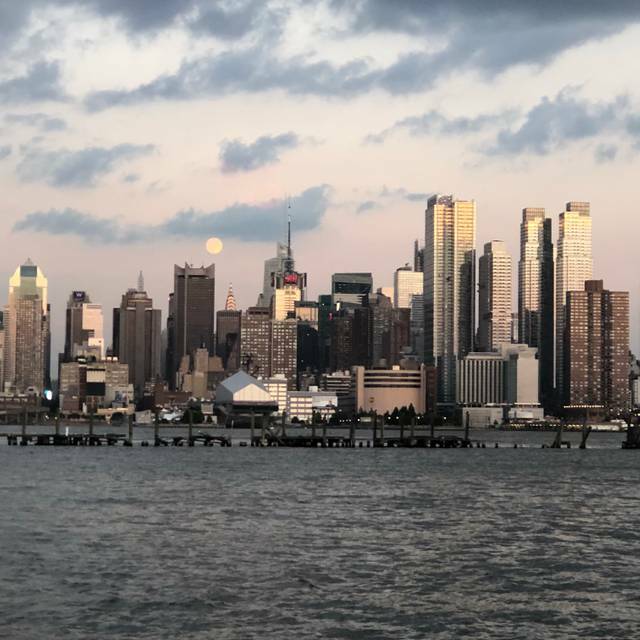 Amazing views of the NYC skyline. Seafood pasta and steak are not good. Even if we don't want, the waitress keep asking for orders. Especially the meat is tough. Great fish! Love the view! We ate here for a belated Valentines dinner. I had the lobster pasta and my boyfriend had the dover sole. My pasta had a lot of lobster meat in it which was great, but sauce was lacking flavor. Good not great. The sole was delicious and a large portion. They said it came with broccoli which it did, a few tiny pieces. More of a garnish really. Drinks were good and the views can’t be beat. Overall I like it here and would return for drinks because of the view but don’t expect to be totally wowed by the food. Some things are better then others. Service was slow, however he was super busy so that is understandable. Didn’t bother us but I could see others getting frustrated. Went in for anniversary dinner, food was great, value not so much. Scenery breath taking . Food was great ! Sangria made just right ! Two stars are for the view - it was spectacular. Otherwise, we were very disappointed in our experience at Molos! The service was mediocre and the food was extremely overpriced in relation to the quality and taste. And to top it off, we requested decaf coffee and were unaware that we were served regular coffee, until we couldn't sleep that night. We will not be returning! Went on a Valentine’s Day dinner and were treated like royalty. Taken to the second floor dining room right next to the windows overlooking NYC. The service was some of the best I’ve ever had at a restaurant and one of the best dates my gf and I had been on in over 5 years. We will be returning for sure. The view is amazing. The restaurant itself is airy and pleasant. Unfortunately my filet mignon kabobs were dry and tough. But everyone else seemed to enjoy their dish. The hummus was good. So was the bread. We ordered from the Fish market. The order came after 50 minutes or more. The fish seemed dry, overcooked and rubbery. The ambience, view is very good. The dessert was average.